Fire Safety Rocks: New Sparkles the Fire Safety Dog Activity Sheet! Wow, I am so excited. My good friends at the Keep Kids Fire Safety Foundation have made a brand new activity sheet just for you! 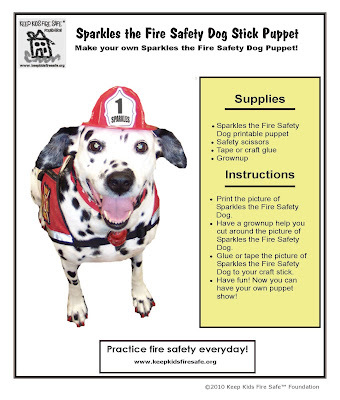 Have a grownup help you click on the picture below to download and print a free Sparkles the Fire Safety Dog Stick Puppet!